The 95-suite, 3-story hotel is located at 6305 East Broad Street, located off Interstate 270 East. This is Buffalo Lodging's 2nd hotel in the Columbus market, 6th hotel in Ohio. Country Inn & Suites Columbus Airport - East changed their name, but the dependable staff and unbeatable amenities and services you've come to love are here to stay! The 95-suite hotel is owned by Benderson Development Company, Inc. and managed by Buffalo Lodging Associates. They partnered with Holiday Inn Express, the fastest growing brand in the industry, opening on average two hotels a week. Buffalo Lodging is excited to be bringing you the all new Holiday Inn Express & Suites Columbus Airport - East. This is Buffalo Lodging's second hotel in the Columbus, Ohio market, neighboring their Hampton Inn & Suites Columbus-Polaris. “We are excited to join the IHG family and bring this brand to our hospitality community,” stated Tom Rousher, regional vice president of operations for Buffalo Lodging Associates. "The Holiday Inn Express brand continues to expand its presence, delivering a special kind of hospitality that makes guests at home the moment they walk through the front door." Guests at the Holiday Inn Express Columbus Airport will enjoy the all new spacious contemporary style suites featuring a microwave, mini-fridge, and a pull out couch. In addition, the hotel features an indoor heated pool, a 24-hour fitness center, 24-hour business center and on-site laundry facility. From conferences to celebrations the hotel provides 740 square feet of meeting space which can comfortably accommodate up to 50 people. The complimentary Express Start™ breakfast bar offers a full range of breakfast items including pancakes from the brand's one touch pancake machine, the signature cinnamon roll, Smart Roast™ coffee, and rotating selections of hot breakfast items such as scrambled eggs or omelets, bacon or turkey sausage and biscuits. Also offered are a variety of healthy options, such as Chobani® yogurt, whole wheat English muffins, fresh fruit, Kellogg’s® breakfast cereals, and Quaker® oatmeal flavors in cups. 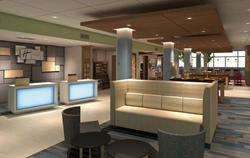 Guests traveling to the new Holiday Inn Express & Suites Columbus Airport - East will find accessibility in taking the shuttle to and from John Glenn Columbus International Airport. Take the opportunity to enjoy the comfort and convenience of this new hotel and its central location to the area’s biggest attractions/activities. For the art lovers, travel back in time to relive the early days of Columbus Museum of Art or enjoy a show at Ohio Theatre. If art is not your thing, but sports is, you will find yourself minutes away from The Ohio State University and Nationwide Arena, home of the NHL Columbus Blue Jackets. While the rest of the family enjoys a day by the pool, shoppers can breakaway with a day at the Easton Town Center, located just minutes from the hotel. Buffalo Lodging Associates owns and operates hotels throughout the Eastern United States and Ontario, Canada. A fully integrated hotel development and management organization, Buffalo Lodging provides operations, marketing, accounting, architectural, construction and MIS services for its own account as well as providing third-party management for outside owners and investors. The company is equipped to develop, construct and manage properties, and is constantly seeking new opportunities throughout the country. For more information about Buffalo Lodging Associates' group of award-winning hotels, please visit http://www.buffalolodging.com. For more information or to make a reservation visit http://www.hixcolumbusairporteast.com or call (614) 322-8000.